October is breast cancer awareness month and all over the world people are walking in support of friends and family, with the aims of finding a cure. 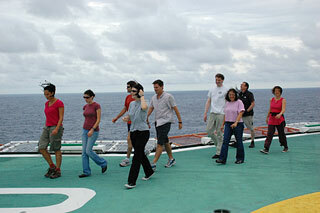 Scientists on the ship joined the movement by walking on the helicopter deck of the ship. It's a unique environment but it goes to show that everywhere people care and can join in a good cause. We had a fabulous time walking and talking and braving the wind. The cruise is almost over now, but we made some very nice friendships that we hope will last for a long long time. 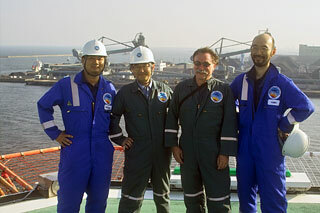 Left to right, Yoshinori Sanada (Logging Staff Scientist, CDEX, Japan), Sanny Saito (Co-Chief, Scientist, IFREE, JAMSTEC, Japan), Mike Underwood (Co-Chief Scientist, University of Missouri, USA) and Yusuke Kubo (EPM, CDEX, Japan) pose for a photo on the helicopter deck just after leaving Yokkaichi Port on September 4, 2009. The 322 science party departed full of smiles and hope. After 5 days of port call, today Chikyu left Yokkaichi port for Exp 322. 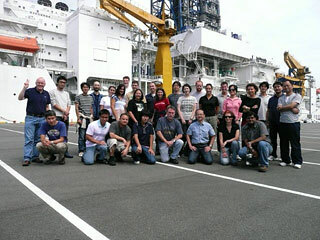 All science participants are now ready for, and excited with, the start of the real part of the expedition. Today we had our last supper on shore, with "some" beer on the table. Some people enjoyed shopping in the town too. We have filled up ourselves before heading offshore. 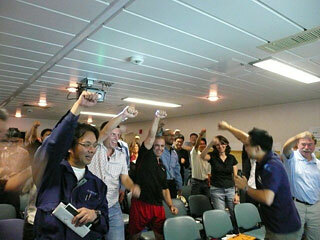 Exp 322 Science Party got onboard Chikyu on September 1st. We are at the port of Yokkaichi. 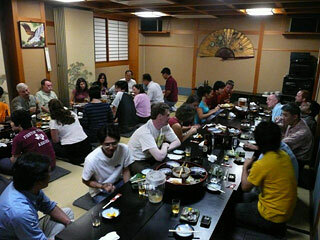 We are getting familiar with each other, ship life, and the various lab facilities on Chikyu. We spend most of the time having a series of meetings and training in the labs. Today we had the pre-spud meeting, which is an official meeting between the Science Party, the ship and drilling crew, and onshore supporters. At first we listened to each presentation carefully, but somehow, we ended up with "dah!"